The invention and creation of devices to measure time has an ancient history. 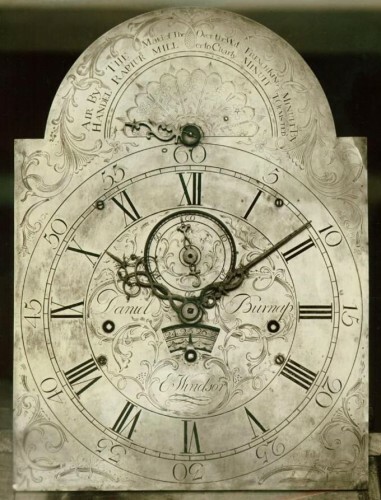 During the 18th and 19th centuries, Connecticut played a major role in the development of clock making. The story of the clock and watch industry in Connecticut begins in 1773 when Thomas Harland arrived in Norwich, Connecticut, from England. In his shop he repaired watches and made clock movements with brass gears and finely engraved dials. One of Harland’s apprentices, Daniel Burnap, set up business in what is now South Windsor where he made many tall clock movements including some with extraordinary musical chimes. One of Burnap’s apprentices was Eli Terry who forever transformed the clock industry. Until the end of the 18th century, clock and watch making was a handcraft. Each clock part had to be made and fitted separately. Timepieces were expensive and not widely owned. During his apprenticeship, Terry learned the craft of making brass movements in small quantities using foot-powered machinery. However he was intrigued by the crude, but less expensive, wooden movements being made in East Hartford by Benjamin and Timothy Cheney. Terry eventually set up shop in present-day Plymouth making both brass and wooden clock parts. By 1806 he had refined his wood movement and begun to cut the teeth of the wooden gears with water-powered saws. 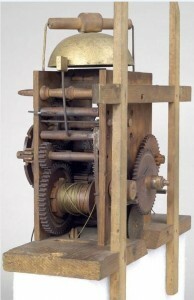 In 1807, Terry agreed to produce 4,000 tall case clock movements for Edward and Levi Porter of Waterbury in three years. This astounding number was far beyond the capacity of any clockmaker of the time. Terry redesigned his factory and production methods and was able to successfully complete the “Porter Contract.” This was the first successful large-scale production of a complicated mechanical mechanism with truly interchangeable parts—and an important contribution to the Industrial Revolution in America. Eli Terry also developed a wooden movement for a clock that was small enough to sit on a shelf or mantel. This reduced the cost in both the movement and the case. Shelf clocks became part of the stock-in-trade of Yankee peddlers. Terry’s innovations and the work of his successors, among them apprentices Silas Hoadley and Seth Thomas, launched Connecticut clock making as an important chapter in the industrial history of our state and nation. Mary Muller, Lead Museum Educator at the Connecticut Historical Society, holds an MA in History Museum Studies from the Cooperstown Graduate Programs and thanks Don Muller for his contributions to this article. “American Clock & Watch Museum,” 2017. Link. Terry, Eli. Patent Number 4,139 - Suspending Balance-Wheels Of Clocks. 4,139. Plymouth, CT, issued August 9, 1845. Link. Roberts, Kenneth D. Eli Terry and the Connecticut Shelf Clock. Bristol, CT: Ken Roberts Publishing Company, 1973. Taylor, Snowden. The Developmental Era of Eli Terry and Seth Thomas Shelf Clocks. Fitzwilliam, NH: K. Roberts Publishing Company, 1985.